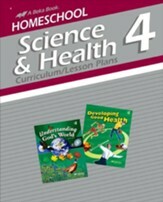 Be the best Health and Science teacher you can be for your child at home with the Grade 4 Health and Science Parent Kit. his prepackaged kit has all the essentials you need to make teaching Science and Health effective yet enjoyable for you and your child. Included is a detailed curriculum with 170 easy-to-use lesson plans, answer keys for all correlated assessments, two sets of teaching charts to help your visual learner excel -8 items total. Skip the hassle of purchasing individual items and purchase this set that has been put together for your convenience. Grade 4. Complete day-by-day plans for the entire year are provided, with assignments correlated to the Health/Science Grade 4 curriculum (components sold-separately). Helping parents to organize and structure their teaching, daily plans for science (27 weeks) and health (9 weeks) are included. Topics covered include physical fitness, personal hygiene, interpersonal relationships, plants, animals, matter, energy, and earth & space. Organized by lesson, these curriculum/lesson plans also include prep work, review questions, oral reading/discussions, subject descriptions, scheduling information, record-keeping helps, and more. Spiralbound. 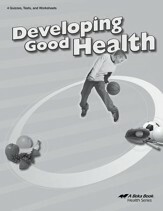 Learning to take care of your body is an important life skill! 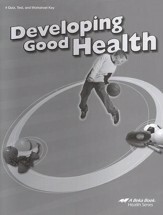 Fourth grade Health students will learn about physical and spiritual health through three units: Physical Fitness, Personal Hygiene, and Right Relationships. 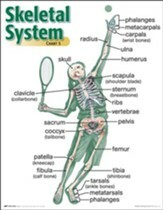 In the physical fitness unit, students will learn about the skeletal, muscular, and respiratory systems, including cartilage, nutrients, types of muscles, the importance of exercise, and more. Personal Hygiene chapters help students understand the importance of good dental hygiene, taking care of skin, and good grooming habits. The last chapter emphasizes the necessity of maintaining a close family and choosing the right friends. Approximately 98 pages, softcover. This text is scheduled for the last 8 weeks of science class, following the completion of the sold-separately "Understanding God's World" (Grade 4 Science). 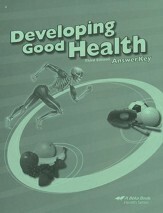 This key accompanies the sold-separately Developing Good Health, Third Edition and contains lists of the questions and answers. Grade 4. This Quiz, Test, & Worksheet Book is part of the Abeka "Developing Good Health" Grade 4 curriculum. Providing parents with the chance to assess student progress, it contains 3 tests, 9 quizzes, 2 review sheets, and 5 anatomy worksheets that cover the material presented in the text. Answers are not included, but are sold-separately in the Quiz & Test Key. Wishing your child had extra reinforcement of his learning before taking his tests? You will love having these 5 anatomy worksheets for him to label and color and 2 review worksheets that include puzzle fun. The 3 tests (including a nine-weeks examination), 9 quizzes, and 7 worksheets are correlated with the not included and sold-separately Developing Good Health, 3rd ed. 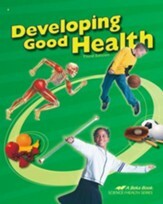 Answers and grading guidance are sold separately in Developing Good Health Quizzes, Tests & Worksheets Key, Third Edition 44 pages, unbound. Grade 4 . This key accompanies the sold-separately Developing Good Health Quiz, Test, & Worksheet Book, with answers and suggested point values. Grade 4. Make it easy to reference and teach important concepts. This set of charts is correlated with the health texts for grades 4-6; they're labeled on one side and unlabeled on the other. 11 charts. 8.5" x 11". Each one of your students has been marvelously created by a loving God! 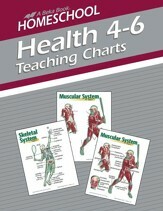 Teach them more about the body that God designed using these 11 double-sided, brightly colored charts. Labels on the front help you teach the material while blanks on the back allow for practice and review. Their 17.5" x 22.5" size makes them perfect for a visual the entire class can easily see. 24 pages. Grades 4-6.